The first time you launch ScreenSteps on a computer a Templates folder is created. You can then update and modify those templates as you wish. If you would like to restore the factory default templates or would like to update your templates because ScreenSteps introduced a new template feature, this lesson will show you how. 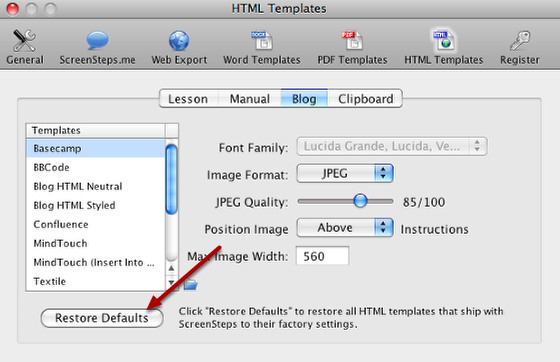 At the bottom of the Word, PDF and HTML templates panes you will find a Restore Defaults button. To reinstall the original versions of the templates that shipped with ScreenSteps click this button. If you have made any changes to these templates those changes will be lost. No changes will be made to custom templates you've created, however. In Preferences I modified the blue css file to have the image appear on the right of the text. However, I'm creating a lesson in which I want the text to be below the image using the same blue template. I noticed when I uploaded two lessons that there still only appeared to be one css file? They share that file? If so, do I copy and rename the css file and use it for the new template? 1. Duplicate the "Blue" template folder and rename it to something like "Blue - Image Below". 2. In that folder rename the "blue.css" file to "blue-image-below.css". 3. Open the index.html file in the new template folder and find the text "blue.css". Replace it with "blue-image-below.css". Now you should be able to export using the template you like.